The sight is unmistakable - frothing white water, violent surface explosions, sporadic waves of silver shards leaping for their lives. It's the annual fall baitfish migration along Florida's West Coast and it's one of the best times of the year to bend a rod on a mixed bag of jacked up predatory species. Indeed, fall finds baitfish along this Gulf Coast region gathering in large schools for the annual southward migration to warmer waters. Those fast and fortunate enough to dodge hungry mouths during spring and summer face the gauntlet of traversing the open Gulf beaches. With days growing shorter and temperatures falling, predators know it's time to pack on the weight for winter survival. And with thousands of baitfish piling through the passes, there's no better place to fill your belly. Once the baitfish start flowing, predators come from inshore, nearshore and offshore waters to gorge. Finding a mobile chow line in 10-20 feet of water certainly fits that plan. When the chewing starts, you'd practically have to fish without hooks to avoid catching something. Gulf Coast passes and the mouths of bays and harbors are the main venues for fall baitfish carnage, but you may also find a good show in deep water channels within Tampa Bay and Charlotte Harbor. Bait balls will often hold over rocks, along channel edges and around coastal structure such as jetties and piers. The latter offers landbound anglers greater-than-usual access to a plethora of coastal species in close proximity. Tides will move the bait in and out during the day and that's an important factor for the fisherman on foot. Boaters, on the other hand, have more flexibility to move with the moving bait. Early mornings typically offer the best show, as the rising sun illuminates the shallow beach brine, thereby making the forage easier for predators to locate. Once the show starts, it's a non-stop food fest for several hours. Despite their raucous behavior, the fish blasting bait balls on the beach have their range of tolerance for angler proximity, so keep your distance to avoid spooking the fish. With the wind - and preferably, the sun - at your back, shut down 50 yards or so from the bait school, cut the motor and drift into casting range. 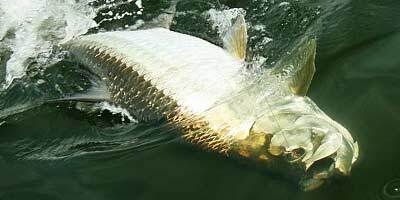 Similar to working a school of tarpon or big redfish, dashing right up to a school of baitfish under attack will stymie the action. If you put the fish down, you'll kill the action for longer than you care to wait, so approach quietly for maximum opportunity. Your best bet will be to observe the school and try to figure out where the gang is moving. With so many different species of predators pushing the bait like a chaotic cattle drive, the action will surface, subside, and pop up 50 yards away. Nevertheless, there's usually a general course of progression. During these lulls, it's tough to predict when and where the show will emerge, but scan the sky for clues. Pelicans, terns and gulls will watch the bait school from above and dip down to grab their share of live and freshly chopped baits. Remember, these guys hunt baitfish for a living, so they're pretty good at leading you to the action. The beach baitfish deal is hardly a technically demanding scenario, but the fall frenzy offers the rare chance to catch multiple species on just about anything you care to throw. Jigs, topwaters, jerkbaits and spoons will all produce strikes. Matching the hatch is always smart, so free line or float a live whitebait or threadfin on the school's perimeter and the vulnerable straggler won't be lonely for very long.